To add a note, click on one of the documents you just added. If you haven't added any document yet, read our article about how to send documents to your accountant. 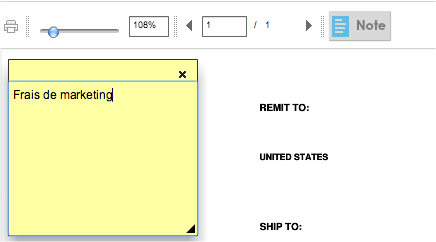 A virtual post-it will allow you to wirte a note on the document. The note will be automaticaly saved. Tip : The more your notes will be precise, the more your balance account will reflect your activities. You'll be able to add the accounting item in your notes ( marketing costs, software costs, phone costs) where your invoice belongs. Your accountant will have the possibility to disregard the suggestion.